After architecture (OK, and food), baseball is probably my one true passion, so when those two come together I’m interested. (And when they come with a good brat and a beer, I’m even more down). Since the early 1990s, ballparks have followed Baltimore’s Camden Yards in trying to replicate the feel of a very specific time period–the 1930s. Masonry exteriors, articulated steel interiors, intentionally quirky dimensions, and a general Ye Olde Ballpark feel to the interiors have all marked these efforts. Nearly all of them have been designed by Populous (formerly HOK Sport), and even though they’ve been popular, they’ve been a mixed bag architecturally. Camden Yards is still, to my mind, the best and the least self-conscious. Some of them are truly bad–the Rangers’ stadium in Arlington feels like a shopping mall inside and out to me, which might be unintentionally appropriate. I grew up going to Cubs and Red Sox games, so I understand that my standards are unrealistically high. Part of those teams’ appeal, I think, is that their parks are so knitted into the city. You’d be out of your mind to try driving to either one, and both of them are wedged in tightly enough that they don’t meet any realistic 21st century standards for personal space. The men’s rooms at Wrigley Field are, deservedly, notorious. So any attempt to re-create the “atmosphere” of an old ballpark is doomed–at least if the owners want to meet the expectations of the average nuclear family who are out for an evening of baseball and not too much contact with their fellow fans. And while one or two projects have attempted some genuinely interesting takes on the old parks’ integration with their surroundings (San Diego and San Francisco), many of these ‘neo-classic’ stadia come off as a slice of suburban kitsch. Sort of like Pottery Barn coming downtown. 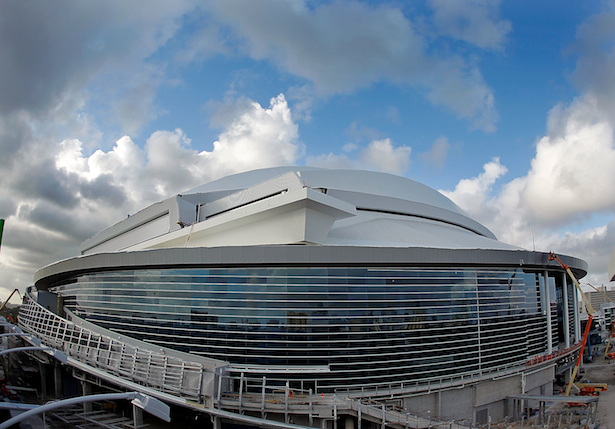 So the new Miami stadium is a couple of weeks into its season, and it’s getting notice for doing something different. It’s also by Populous, but it’s abandoned any pretense of fitting in or referring to some fictional “golden era” of the game. (Reminder: baseball’s “golden era” included precisely no African-American players in its “major leagues.”) Instead, it’s sort of gloriously Miami–brash, bright, with a sort of horrifying Red Grooms sculpture in the outfield that explodes whenever the Marlins hit a home run and aquariums full of live fish behind home plate. An article in today’s Times describes it’s “panache” and it’s attempts to fit in economically–if not formally–to it’s Little Havana neighborhood. It’s not really my cup of tea, but it’s at least trying. I don’t agree, though, that it’s the game’s first 21st century stadium–that honor, clearly, belongs to Yankee Stadium, which replaced a genuine (if badly mauled by a 1976 renovation) piece of history. The new Yankee Stadium encapsulates everything that’s gone wrong with the game, catering to the skybox crowd while relegating the huddled masses to distant, overly steep seats. Like all major league sports, baseball has found itself playing more and more to the 1%, and the new Miami stadium follows that trend, too. A slightly tired student this afternoon promised an “explosive axon” for his final review. I think this is incredibly promising, but I may sit near the back when he presents. The drumbeat of late modernist works under threat of the wrecking ball continues. As reported in the New York Times this morning, there’s a move afoot to raze Paul Rudolph’s Orange County Government Center in Goshen, NY. The Center has been derelict since being damaged by storms last year, but this final blow was only the latest in a long history of leaks and waterproofing failures. The article repeats the points made by a number of recent preservation cases, primarily that buildings of the 1960s and 1970s, long-since out of fashion, have few fans among the general public, and many admirers among architects and academics. In particular, the Times notes that brutalist buildings have a terrible reputation as being cold, thoughtless, and less than functional. This comes in large part from the perceived hubris in their diagrammatic conception and relentless execution–there’s nothing the general public loves more than seeing a gigantic ego trounced by trivial but nagging failures. While one can argue until blue in the face about the number of quite sensitive and carefully executed brutalist structures–Salk, anyone?–the fact is that like so many other ‘movements,’ brutalism came to be judged not on its finest monuments and practitioners, but on the ability of lesser designers to conveniently slap the label on to slipshod work as an intellectual justification. And the name itself is not exactly good marketing–originally inspired by Corbusier’s use of beton brut and thus related to the art brut movement, who could argue with the easy association “brutalism” can make with the “brutal” lack of nuance its less talented champions exhibited. There are serious preservation campaigns to be waged for many of these buildings. Kahn’s Yale Art Gallery, which might well stand as the first American instance of the movement, recently enjoyed a brilliant (and expensive) restoration at the hands of Ennead. The National Theatre in London is under constant threat and remains wildly unpopular with the public despite having monumental importance in the history of postwar British architecture. These sorts of projects are, I think, worth going to the barricades for. Really? Ahead of which one of these? In other words, it’s all too easy to inflate every battle into a life or death struggle. There is late modernism worth saving, and there is late modernism that suggests cultural survival of the fittest might best take its course. There’s bad classicism, too, that we should have an honest and searching debate over. Goshen was an important Rudolph work, but if we call it one of his best, then what happens when Tuskegee comes under threat? Or the Cocoon House? In this case, with the cost of renovating the Center at something between $35 and $65 million, I think we preservation-minded folk ought to contextualize a bit. Sure, it would be a sad day to lose another Rudolph building, but it would also be a sad day if Goshen renovated this instead of building a school, or instead of patronizing an innovative young firm to design a new Civic Center on the Rudolph site. That may get my brutalist merit badge taken away from me, but part of the rhetoric then was that we ought to be slightly fearless in eliminating things that didn’t work or that had aged poorly, and in looking forward. Fossilizing every single Rudolph building seems counter-intuitive. You are currently viewing the archives for April, 2012 at architecturefarm.